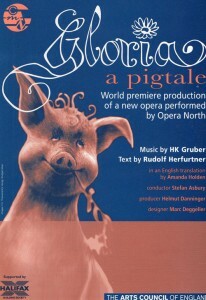 Gloria, a pigtale is a comic opera about an ambitious but stupid young sow who dreams of being rescued from her sty – and the local abbatoir – by Gilbert, a handsome hog of a prince. The fairy story was written in Bavarian dialect by Rudolf Herfurtner, who also wrote the libretto. The production was shared by Opera North and the Big Bang Theatre in Munich. The world premiere took place in the (new) Lawrence Batley Theatre at the Hudderfield Festival in November 1994 and was performed in English. Mary Hegarty played Gloria and Stefan Asbury conducted. The production toured to Newcastle, Aldeburgh, Leicester and finally, London’s Queen Elizabeth Hall. The US premiere took place at the Aspen Music Festival, Colorado in 2002, conducted by Diego Masson. In the summer of 2014, Frederic Wake-Walker’s production for Mahogany Opera toured the UK and performed at the Bregenz Festival. In New York, Alan Gilbert conducted another new production at the Met museum in a production by Douglas Fitch, of the theatre company Giants are Small, with performers from the Juilliard School and the New York Philharmonic Orchestra. Read the New York Times review. AH: I wrote the English version while staying in Aldeburgh in the summer of 1994. Having consulted a Bavarian friend about traditional pork cookery, I swiftly realised that an English version could only work if the German culinary traditions were exchanged for British ones; so I repaired to my cookery books for inside knowledge of chitterlings and chipolatas.